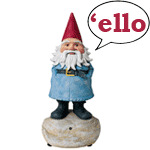 The Travelocity roaming gnome might be the most loveable gnome on the planet. While we can’t guarantee that our Travelocity gnomes will cure your wanderlust, we can guarantee that they’ll look adorable in your home or garden. Visit GardenFun for Travelocity Gnomes for sale all year long. The classic choice is the original Travelocity garden gnome, complete with a white beard, rosy cheeks, blue jacket and red pointed cap. 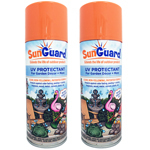 It comes in 8-18 inch styles to fit your indoor and outdoor spaces with ease. Our 8-inch statue is a great addition to help you get through those long dreary winter months. Our Travelocity talking gnomes come in 8.5 and 13 inch sizes to fit any space in your home or yard. These motion-activated figures come with this character’s authentic licensed voice and sayings to shock your visitors and keep you laughing. Each talking gnome will exclaim “There’s no place like gnome!” along with many other fun sayings. Our talking models require three AAA batteries, not included with purchase. Add a themed Travelocity gnome to your collection. Our themed Travelocity gnomes include Christmas and summertime styles for every home. Our warm-weather gnomes will remind you of your favorite vacation memories, or they will encourage you to plan another. Our Hawaii gnome comes complete with a flowered cap and straw skirt, while our snorkel gnome comes ready to dive in with his scuba mask. Try a talking Travelocity Vampire gnome to add to your Halloween decorations. Our talking Christmas gnomes are always popular around the holidays. Choose from our Christmas lights and Santa gnomes to complete your home’s holiday celebration. 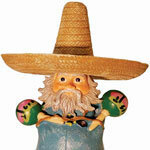 GardenFun has the Travelocity gnomes for sale that will complete your gift list. People of every age love these popular gnomes and their commercials. Welcome one into your home to remind you to smell the roses in your garden. That's right, the official Travelocity Gnome is ready to become a part of your own incredible adventure! A citizen of the world, this hysterical Roaming Gnome makes a great garden gift for all your adventurous friends and coworkers. You've seen these Travelocity Gnomes on the Amazing Race, Online, and on all those hilarious commercials. Now you can bring the roaming gnome anywhere you like.